Throughout August I’ll be taking you through some of the simplest recipes, (with just five ingredients) that are not only easy to prepare but keep your hunger and energy stable. This week, we’re kicking off with this five-ingredient spiced cauliflower and pumpkin. I love the ingredients in this dish – the pumpkin is so grounding and flavoursome, while the spiced cauliflower contrasts with the sweetness. Both cauliflower and kale, of the Brassica (cabbages) family, deliver the powerful phytonutrient, sulforaphane, to this meal, which can help the body eliminate carcinogenic substances. The final nourishing kicker is the walnuts, providing essential fatty acids for brain health and to keep hunger at bay. Preheat oven to 200°C and line a large baking tray with greaseproof paper. Place pumpkin pieces and cauliflower on tray drizzle with olive oil, season with sea salt and sprinkle curry powder over the cauliflower pieces (only) and ensure the ingredients are coated well. Place in oven to cook for 40 minutes. Whilst cooking, marinate your kale in a touch of olive oil and salt, massage it in with your hands and set aside. 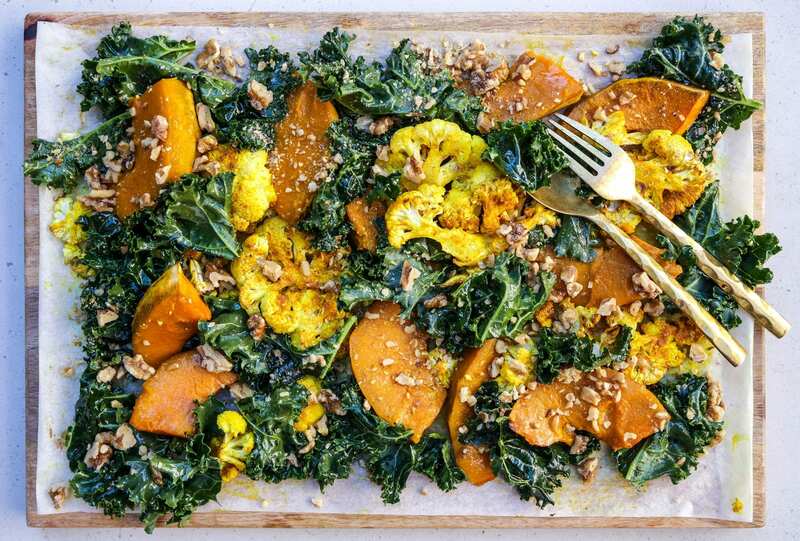 Once veggies are cooked, remove from oven and arrange kale leaves through the veggies, sprinkle with all the walnuts, season with pepper and serve.